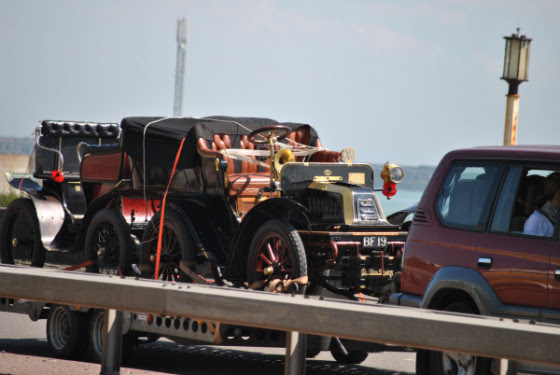 A car like this would have been on the road only a century ago. Imagine how much has changed since 1916. This was the future – and it has shaped our world in many ways. “…Wind, rain, and flooding continue across the Midwest, no relief in sight.” The radio signal was sketchy, but the ominous news was clear: more of the same and getting worse. The old farm was a target for rising waters. Amber looked around her grandparent’s farmhouse, focusing on her favorite picture of them. They stood beside their new Model T, black and shiny, smiling shyly at the camera, ready to take on the future. After all the years of carbon emissions from 1.2 billion cars worldwide, things had changed. And the future they were racing toward was suddenly very different indeed. Great story, Erin. I like the way you connected the past and present day in a seamless and powerful way. Everything has changed for sure. My mind spends half the time a century in the past. Amazing how things have changed in the past hundred years. Well done. How would they to know that their model-T started it all…? Poor old model T: myself I prefer steam power. Yet if we had 1.2 billon steam driven cars on the road or the same number of horses carrying us about. I wonder? Wonderful story, full of nostalgia and understanding. When change is new, we seldom know where it leads. But when we do see what consequences change can have, like we do, and do nothing, like we do, then we are culpable. Nicely linked, and a great way to address the prompt, Erin. Well done. I could see this clearly.